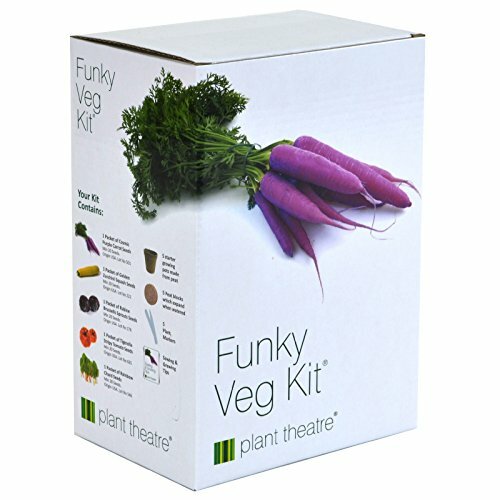 PLANT THEATRE'S Funky Veg Kit® is the ORIGINAL and BEST, beware of imitators. EVERYTHING YOU NEED TO START GROWING your funky vegetables in one box, we've left nothing out! Ideal for beginners, gardeners and children alike. INCLUDES 5 Peat Growing Biodegradable Pots, 5 Peat Discs that expand to 7 times their size when watered, 5 Plant Markers and of course 5 foil sealed seed sachets, plus full SOWING & GROWING TIPS. GREAT GROWING PERFORMANCE - all our seeds are laboratory tested before release by our leading US seed supplier and then sealed in foil packets for freshness! MADE IN THE USA and 100% NON- GMO. DISTINCTIVE and UNUSUAL vegetables: PURPLE CARROTS; a stunning hybrid that combines GREAT TASTE with VIGOROUS GROWTH, YELLOW COURGETTES great SLICED in stir fries, STRIPPED TOMATOES - unusual and ideal for stuffing, RED DELICIOUS BRUSSELS SPROUTS a novelty purple-red sprout will add colour to your plate, it RETAINS its novel colour after cooking! MULTI COLOURED SWISS CHARD - an exciting mixture offering coloured stems in classic RED, WHITE, PINK, VIOLET, GREEN- GOLD, ORANGE and YELLOW! BRIGHTEN UP MEALTIMES with this exciting selection, PERFECT GROWING EXPERIENCE for young and old, beginners or old green fingers! Get growing today. Home grown TASTES EVEN BETTER. A THOUGHTFUL GIFT beautifully presented in the illustrated gift box, this seed kit has everything you need to start growing, go on treat yourself or a LOVED ONE today!